Hailing from Eastern Stockport, Lazlo Baby bring you Balkan folksy ska with high octane exuberance. 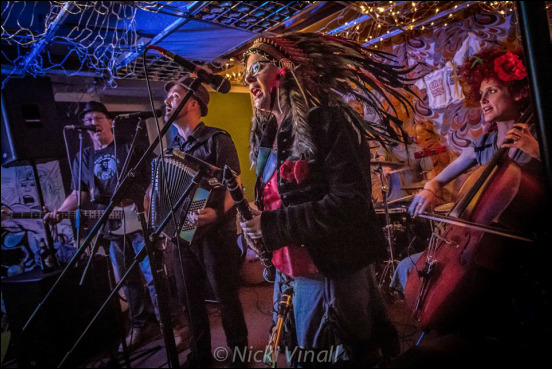 Whilst dabbling in the delights that klezmer, gypsy and trad Irish music have to offer, Lazlo Baby stitch together pounding melodies that'll clobber you with their enthusiastic brouhaha. Ian Cripps (Fatea Magazine) "Just watching Lazlo Baby at Cloggerfest really getting the crowd going - more energy than a power station. Highly recommended!" "Few bands have such a real, genuine love of playing live music with no pretensions and genuinely convey such a happy attitude to playing music to entertain one and all"